Water & Air seeks to exhume history’s ghosts from the four elements, transporting and processing them through both craft and recorded media. The individual works in the installation-based exhibition—Water, Air, Earth and Fire—recreate the elemental aspects of the landscape within the gallery space using manipulated, projected recordings of the creek that runs behind Fankhauser’s grandfather’s farm, the sky above it and the earth it crosses. Grounded in the superstition that a camera can capture the soul of its subject, the videos transpose the soul of the land and all the ghosts that have left it scarred, inscribing their history onto a new location. Water: a video, shot by Fankhauser, of the Four Mile Creek is projected on the floor at a narrowing angle, slightly distorted. In it, water churns in an extreme close-up, a super-saturated blue, rendering the gallery floor unexpectedly textural and seemingly unstable. Earth: footage of the field behind the farmhouse recorded at night, is screened on a monitor positioned like a window inside a wooden shed Fankhauser has built on site, just outside the gallery space. We look outside to the darkened land; a void of anticipation. Fire: the sound of hymns. The congregation of Humboldt’s Four Mile Church sings hymns during a Sunday service recorded by Fankhauser in an alcove of the gallery, igniting a concentrated, isolated sonic atmosphere through the slow burn of spirit. 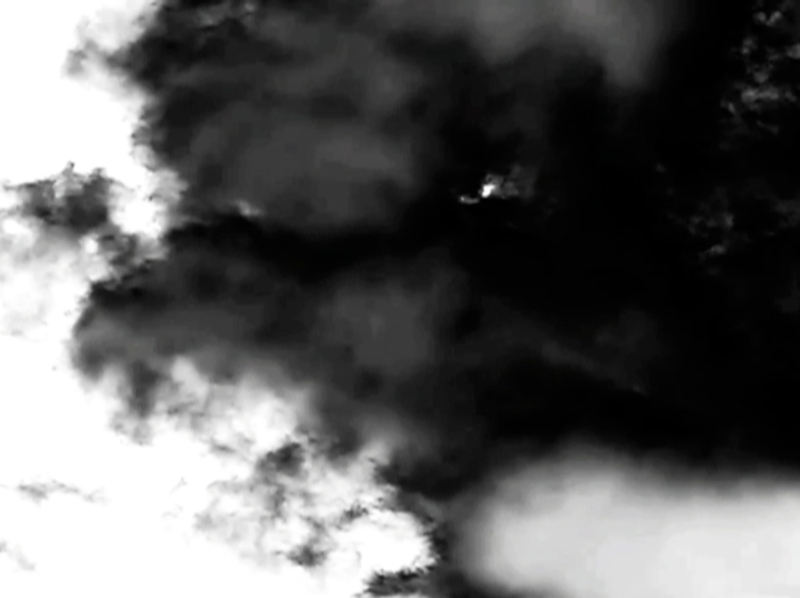 Air: a video in inverted black and white: clouds float past in an unsettled sky, intermittently coalescing into something grotesque. Air is projected on a screen woven by Fankhauser, made from hand-spun yarn shorn from sheep that graze on his grandfather’s farm. The woven screen anchors the work to the land itself, its physical presence, the processes connected to it, its histories. It connects the intangible to the physicality of things; to the act of making. Water & Air moves from the specificity of Brandon Teena’s murder to consider more broadly the ways in which restless histories permeate the water, air and land that surrounds us. Between the natural world, the physicality of the built landscape—farmhouse, shed, woven screen—and the ethereal artificiality of recorded media, Water & Air traces the textures and imprints of queer histories on a seemingly distant, disembodied present... to see if those ghosts will travel.